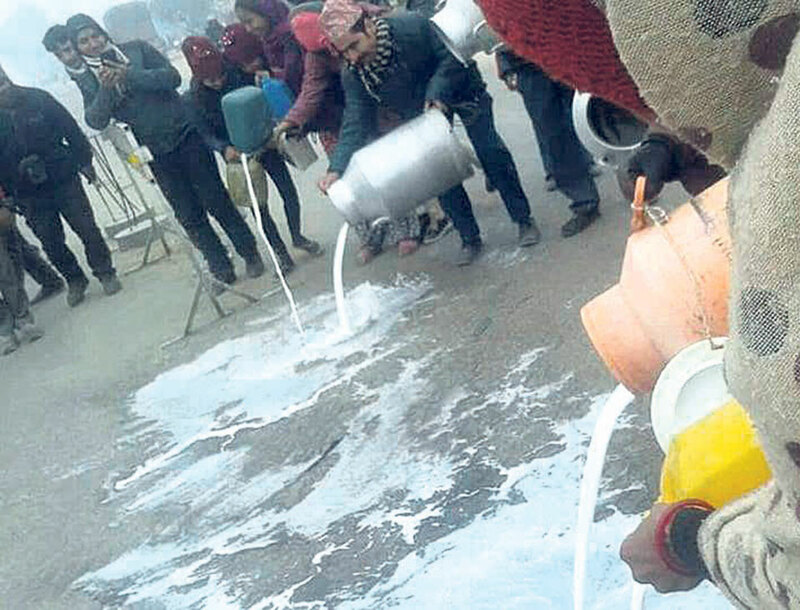 TIKAPUR, Jan 9: Farmers of Lamki of Tikapur spilled milk on the street on Monday morning as part of their protest against Dairy Development Corporation (DDC). The farmers took to the street by spilling 50 liters of milk on the road after the DDC stopped buying milk from farmers. Indra Devkota, a dairy farmer of Lamki, said DDC had shown reluctance to purchase milk from farmers since September, 2017. It stopped purchasing milk from December 31, 2017, he added. “We have started buffalo farming taking loan from banks and financial institutions. How are we are supposed to pay back our loan now? How can we learn livelihood,” Devkota said. Devkota is not the only one. Many farmers from Lamki, Bauniya, Pratappur, Chuha and Pathraiya are facing this problem. Farmers are facing financial crunch as they are not being able to sold milk produced in their farm. The state-owned dairy producer has provided only one tanker having capacity of 4,600 liters for Attariya-based Dhangadi Dairy Project. This is the only tanker to collect milk produced in all the districts of Province 7. The chilling center had been collecting 13,000-15,000 liters of milk every day. As only around 6,000 to 7,000 liters of the total collection can be consumed in the local market, remaining milk has to be supplied to Kathmandu, Pokhara and other districts. Only around 700 to 800 liters of around 2,000 liters of milk collected in Lamki is consumed locally. “We are facing problem to supply the remaining 1,200-1,300 liters to other districts,” Giri added. Meanwhile, local farmers say that the government was discriminating against people of the far-western region. They say that the government was not providing sufficient tankers to areas where milk production is high. According to them, Kailali and Kanchanpur districts produce 12,000-14,000 liters of milk every day. Local farmers also alleged that the DDC was importing milk from India while milk produced in the country goes to waste. “While milk produced in the country goes to waste, DDC is buying 40,000 liters of milk from Bihar. This is a game of commission,” local farmers added. Meanwhile, the farmers have also asked the government to pile pressure on DDC to purchase milk from them.